Are you a hopeless romantic? If so, you’ve probably seen the movie Sleepless in Seattle more than once. This year you can recreate the steamy scenes and emotions from the film with your special someone by booking Lakeway Resort and Spa’s “Sleepless in Seattle” package. Overlooking refreshing Lake Travis on the northwest side of Austin (there’s still some water), Lakeway Resort combines the grandeur of a world-class destination with the charm of the Texas Hill Country. Ample glass walls and decks allow the magic of the lake to drift indoors. And because this winter is mild, you’ll enjoy roaming outdoors before settling in for a sensuous night on Saturday, February 11, 2012. Start your fabulous evening with a chilled bottle of champagne delivered to your room upon arrival. Then dine on an elegant five-course dinner while watching Tom Hanks and Meg Ryan sort out their star-crossed fates in the award-winning 1993 romantic comedy. Executive Chef Jeff Axline plans to tempt your taste buds with a sumptuous menu featuring Dungeness crab cake, smoked Pacific salmon, pan-roasted duck breast, grilled filet of beef, lobster, and butternut squash risotto. Finish with an exquisite chocolate mousse cake—and when the mood is right, take the elevator home. Rates start at $330 per guest room package and reservations must be made by February 11. Book online at www.lakewayresortandspa.com or call 512-261-6600. 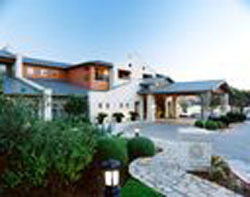 Lakeway Resort and Spa is located at 101 Lakeway Drive, Austin, TX 78734.